On March 28, I am doing a seminar at Humble Sewing Center (Sew Vac Outlet) on Crafts and Embroidery. I’ve spent the last couple of weeks creating samples for the seminar, using Designers Gallery Embroidery Works, Floriani TCU, and Artistic Simple Cut software. For more information about the seminar or to register, visit www.sewvacoutlet.com. I’ve embroidered shirts, created banners, cut and pressed glitter heat transfer on t-shirts, and added rhinestones for some added bling. All of the projects started with appliqué embroidery designs, which I purchased from Planet Appliqué or digitized myself. I even created a vinyl design for our motorhome using the same process. 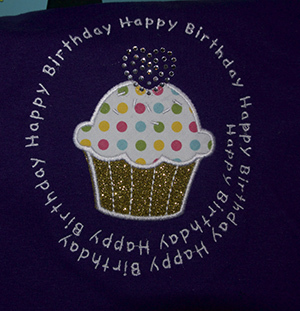 About three years ago, I fell in love with adding rhinestones to t-shirts. At that time, Janome introduced the Artistic Creative Products which includes Artistic Simple Cut (formerly known as Artistic Crystal). The Artistic SimpleCut software does exactly what it’s name suggests: makes cutting simple! When you hook up Artistic SimpleCut to your Digital Cutter, your possibilities are endless. You have the ability to create shapes, motifs and designs in the software and cut it out of virtually any material. You can cut fabric for appliqué, templates for crystal designs, vinyl to adhere to shirts, glassware, walls or mirrors, magnets for your car or fridge, paper for any scrapbooking or paper crafting projects. Be prepared to find yourself experimenting with new techniques, materials and designs in no time! The Artistic Simple Cut software connects directly to some digital cutters, such as the Zing, Silhouette Cameo, and others. broidery Works was used to create the spiral text on the t-shirt. In addition, Floriani TCU, now save artwork in .svg format which can be opened by the Silhouette Studio or Artistic Simple Cut. So by now, you are probably wondering what I have created. I took some ideas from Designers Gallery and created some different projects. I purchased some appliqué embroidery designs from Planet Appliqué and created a few of my own with Mardi Gra s, Birthday, and Graduation themes. 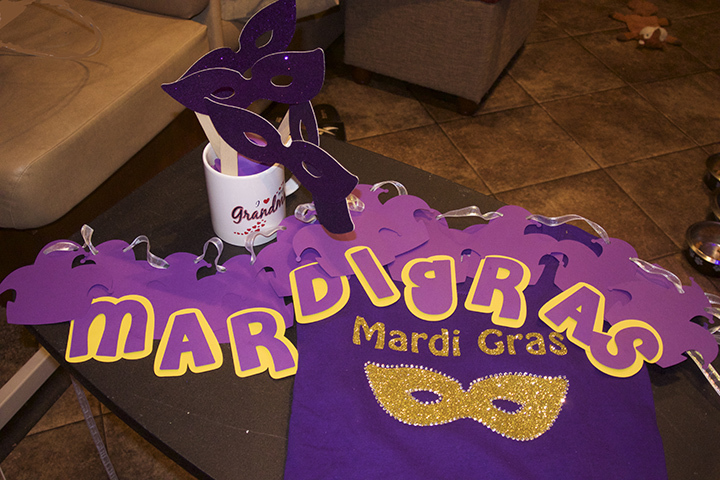 I made banners, shirts, masks, and goodie bags. I also created vinyl design for our RV. I used a picture of our RV and digitized an appliqué embroidery design. This entry was posted in Uncategorized and tagged crafting, digital cutters, embroidery, embroidery software, seminar on February 26, 2015 by Designs by Marje.